Microsoft does not recommend to work directly with SharePoint databases. Often, in the current activity of a company, we need surveys to study the opinion of colleagues, employees or customers. Any such process requires a stage of questionnaire design, approval, testing and publishing. But, unfortunately, it may cause errors in the workflow approval. As we all know, the most common errors are typo mistakes. The questionnaire is published, users began to fill in the data, possibly anonymous (no login), and someone noted that there was a mistake in the text. The temptation of the author or owner of the questionnaire is to go into the settings and change incorrect response options. A classic mistake, because after the change, if you access the Graphical Summary of survey, we will see a situation like the following. 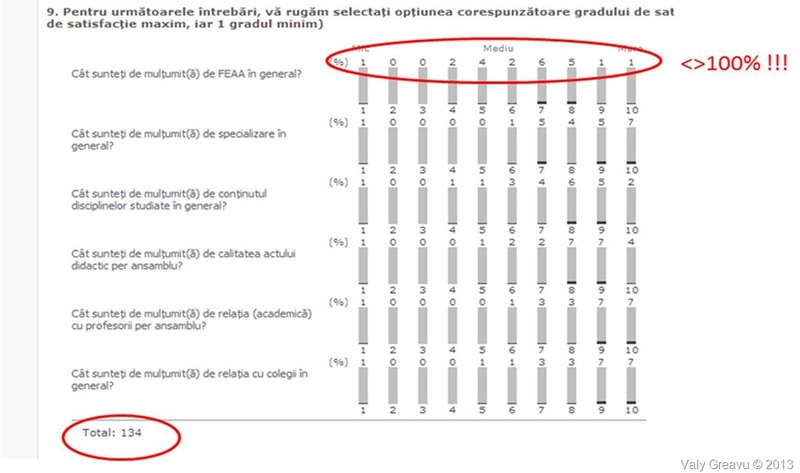 As you see, even though the questionnaire is in Romanian language, there are several answers (134) and the percentage shown in the graphical representation is different from 100%. When you change the options in a survey question, the old values are no longer displayed. The good news is that the data is in the database and can be extracted from there with a simple select statement. 2. Identify the content database for your current site. You will obtain a list of records with all your answers. Select all records, Copy and Paste into an Excel worksheet and manipulate data as you want. Now all the answers are “back”. Never modify variants of questions from a survey after it has been published!